The Michigan flavor is heavy in this Iowa football recruiting class. IOWA CITY, Ia. — A big tip of the (cowboy) hat goes to Iowa all-American cornerback Desmond King for the Michigan-based flavor in the Hawkeyes' latest football recruiting class. The presence of Iowa’s senior-to-be Jim Thorpe Award winner certainly helped the Hawkeyes' cause in landing two big defensive linemen from his alma mater, East English Village Prep — Chauncey Golston (6-foot-5, 227 pounds) and Cedrick Lattimore (6-5, 260). The Hawkeyes also nabbed a huge signing-day score in 6-7, 285 Detroit offensive tackle Alaric Jackson, who signed with Iowa in a Wednesday announcement over Michigan State and Nebraska. Yes it is, Coach. King was shown on Twitter wearing a cowboy hat and cowboy boots in the lead-up to the Thorpe Award ceremony earlier this week. He wore the attire to center court Wednesday night during halftime of the Iowa-Penn State basketball game, too, when Iowa’s football team was honored for its Rose Bowl run. Four prospects from Michigan were among Iowa’s 24 signees — 17 percent. The Hawkeyes are also signing defensive back Cedric Boswell of Beverly Hills, Mich.
Jackson’s signing capped this class nicely and put to rest worries that Michigan would take him with a late push, as it did last year with Iowa running back commitment Karan Higdon on signing day. “We felt really good after his (official) visit that he had strong feelings about us, and I don't think that's ever wavered,” Ferentz said. “I'm not going to say I wasn't worried about it or concerned about it, but anything can happen in recruiting. It was not surprising but notable that Iowa didn’t pull scholarship offers from defensive ends Romeo McKnight or Austin Schulte after both suffered a torn ACL early in their senior seasons. 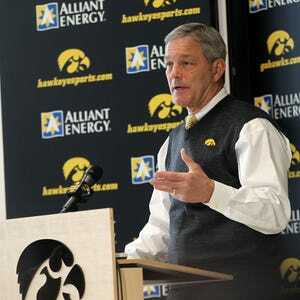 Each player accepted the Hawkeyes’ scholarship offer in June. Michigan coach Jim Harbaugh made headlines a few weeks ago when he pulled a scholarship offer from an offensive lineman that had orally committed two years earlier. 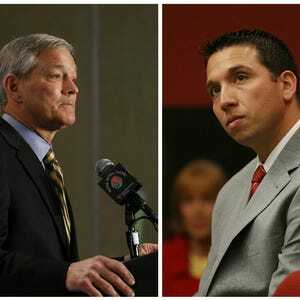 “Once we make an offer, a commitment to a player and they make a commitment to us, it's a two-way street,” Ferentz said. “That's just something we believe in. The reality is there aren't a lot of career-ending injuries in football. It could happen realistically, but it doesn't happen very often. Iowa made a smart decision in elevating Seth Wallace to replace Jim Reid as linebackers coach. Wallace has five years of FBS coaching experience under his belt at Iowa — three as a grad assistant under Norm Parker from 2006 to 2008 — and the last two as a full-time recruiting coordinator and defensive backs coach. There won’t be any lost time explaining the Iowa system to a new coach. Wallace, 37, understands the system through and through, and he's stoked about the change. So that leaves an opening at recruiting coordinator, which Ferentz said Wednesday could be filled in a couple weeks, with “maybe somebody on our staff.” Applications are being accepted through Friday. Wallace will continue to lead recruiting efforts in the meantime. Iowa’s recruiting class is filled with athletes who could play multiple positions — which gives the coaching staff a lot to think about before these guys get on campus in June and in practice in August. Shaun Beyer could play tight end or defense; Nick Niemann could play linebacker or bulk up to defensive end. Position coaches might be fighting over these guys and others. Noah Fant (a two-way talent) will start his career at tight end; Kristian Welch (a tight end) and Barrington Wade (a star running back) are going to play linebacker; Lance Billings and Emmanuel Rugamba (both standout receivers) are ticketed for cornerback. Of the five defensive end recruits, look for Lattimore as the most likely candidate to move to defensive tackle eventually. Who could play right away? Why 24 instead of 25 signees? New Jersey wide receiver Frank Darby committed to Iowa on June 22, but he did not sign a letter of intent Wednesday. Darby needs to qualify academically. If he doesn’t make it, look for him to go the junior-college route and for Iowa to make Pella athlete Noah Clayberg the 25th signee of this class. Clayberg amassed 3,541 yards and 51 touchdowns as a dual-threat quarterback for Pella last fall and has accepted a gray-shirt offer from Iowa — meaning he’ll enroll as an Iowa student and join the football program next January on scholarship as part of the Class of 2017.